I want to thank myself for using "Artistic World" as a title of this blog. I used this because i love art, and through art and blogging, i express myself in a way that i will expand my skills and being RESPONSIBLE. Art. People use this to express, to be heard. Sadly, it seems like the essence of RESPONSIBILITY IN ART is gone today in artists. For the sake of art, they express, without even considering parties that may be affected by expressing. We are all allowed to express what we feel because we live in a democratic country, but we know that this has a limitation, a limitation of Respect, Responsibility and Awareness. Very poor. Call me narrow-minded, but i tell you. I am Hurt. It seems like this is no longer for the sake of art anymore but "For the Sake of Expressing". Art and Expression is no longer singing in the same rhyme in this exhibit. Yes, you explained that you have already brought your art to the different parts of the world yet only the Philippines is the only country that criticize your art. Man, think, PH is different, it has it's values, it's respect and responsibility. tsk tsk tsk, i don't wanna hurt you expressionist because of my words, but i just wanna tell you that watch what you're doing because you may hurt parties by your expression. I know i am an amateur and you are a pro, but how come that you are a pro yet it seems that you don't your responsibilities as an expressionist? I am hurt because i don't want my Lord to be humiliated in that way. Those Christians who say that "I am a Christian but i am not offended by this art" for me is not really a real christian. A real Christian lives by the Glory of the Lord, and part of it is your will to protect your Lord, your Father in to any way of disrespect and humiliation. A real Christian feels what his Lord Feels. So you think that this art is just fine for Him? His face is painted with scary form of expression, accented with some sort of sexual symbols? Yes, the symbols may not be representing Jesus and it may be created by human, but, the symbols that is created by man is a way of communicating to the Lord. 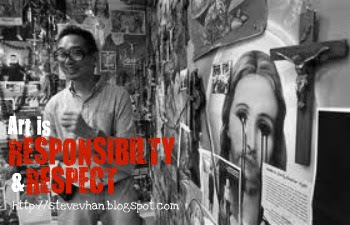 As an Artist, it's a package of Respect and Responsibility. I believe that when you don't have these two quality, you will never be considered as an artist, but as an expressionist itself. Iam Hurt as a religious person. I believe in Christ and i don't think that this form of expression is an art. If i will going to express myself and i am a Christian, i will not express in this way or to any parties that may humiliate them. We all have different ways of expression, but we need common things to be successful as an artist despite of our differences. These things are: Art, Responsibility and Respect. If i will going to express i won't hurt parties, such as Muslims, any religious organization, people and culture. FYI: The expressionist is not a believer to any religious practices, as what i saw in the news, that's why maybe he doesn't know his limitations. Once again, I am moved by your post and it sent my brain reeling with lots of feedback. I agree with you, there's always a line. Right now, all I see in that "artist" is a person who wants to stir up a controversy just to get attention. Freedom of expression, yes. But for what purpose? What advancement do we benefit from with his expression? If I replaced the pictures of Jesus Christ and replaced it with photos of his mom or dad, won't he be offended? Will he still call it art? Or will he attack me too for abusing my freedom? I love artwork too, I love controversy, and I admire a lot of artists who truly come up with great stuff with great messages. This exhibit is in bad taste and not even interesting. Very controversial ang issue na yan sobrang nakaka offend! Kulo ang title ng exhibit. Bagay kasi nakakakulo ng dugo ang ginawa ng artist! To me napaka disrespectful nyang tao. By the way, Thanks a lot nga pala sa award! I appreciate it so much. have a nice weekend! Of all the million subject that an artist can choose from. He did a bad choice. Like all, freedom comes with responsibility that is not to abuse that freedom to do what ever he wants regardless of what the other people feel. He abused this freedom and he should know the consequence of his action. A person who claims that he is a Christian yet is not offended if Christ is insulted or attacked is a false Christian. A true Christian always respect Christ in any thing that he does. Kaya nga tinawag siya na CHRISTian eh. Kahit anong profession mo, as a Christian - you will always put Christ first. If you are a baker, you will put Christ first by offering your talent in making a delicious bread na hindi makakasama sa kalusugan ng kakain nito. If you are a judge, then you will take into consideration the teachings of Christ before giving the verdict to an accused person. If you are an artist then you will honor Jesus Christ in your art works. It is un-Christian to insult Christ on any medium of art. Don't be fooled by people who claim that they are "Christian" but said that they are not offended by Mideo Cruz' trash. These people are the neo-atheists and I fought them various times online. They are all for the destruction of religion, destruction of family, and disrespect of human life because many of them approve abortion. They promote unlimited freedom and they do whatever they want even if they step on other people's toes. The mascot of this group is Carlos Celdran. These people don't believe in God that is why they don't show any respect to any things that the religious people consider holy. They are eager to attack Christians because we are adhere to the teachings of Christ "to turn the other cheek." Mabuti at nahanap ko ang may post ng about sa Kulo....well ang masasabi ko ay wala namang problema sa ginawa niya. Ang may problema ang mga tao na kumundena sa art niya. Hindi ba naisip ng mga tao na kumondena sa ginawa niya na maraming nasa alagad ng simbahan ang tumatanggap ng regalo na galing sa masama.....pera mula sa jueting..ang pajero scandal ng mga obispo..sila ay mataas ang posisyon bilang alagad ng diyos pero bakit gumanun sila na tumanggap pa rin..gayong kapag sila na mga obispo o pari kapag nag sesermon ay minsan sinasabi na huwag tumanggap ng pera mula sa masama..
Pero tama din na dapat ang art ay may limitasyon..
pakialaman nila ang lahat ng imahe, hindi ordinaryo na tao ang nasa imahe, at wag ihambing sa mga tao na nasa simbahan na nkagawa ng kasalanan dahil hindi yan perpekto kahit bali-baliktarin mga tao pa rin yan tinatablan yan kamunduhan... kung dito sa amin yan lintik lng ang artist na yan, isasama ko siya kay satanas! lahat tayo hindi perpekto,,, sana naman wag na dagdagan na katawa tawa ang mga filipino artist, kung may galit kayo mga artist sa gobyerno natin sana wag nyo gamitin ang mga Holy Relics ng mga Katoliko, respeto lang, huwag mag abuso sa mga rights nyo! I was offended too seeing the pictures online. Napasambit na lang ako ng "grabe naman ung taong un... anong utak meron sila?" I mean kasama na ung mga CCP people and the artist... what could have been running in their damn minds? Of all the countries... dito pa talaga sa Pilipinas pinakita ung so called art works niya. For sure they know majority of Filipinos are Catholic or should I say religious... seeing what he did would DEFINITELY offend us. Ewan ko ah... pero ang GAGO talaga nung nangyaring un. Nakakalungkot isipin na may mga taong hindi naooffend sa ginawa niya. Ganon na ba kababaw mag-isip mga Pilipino? Tama ka Steve... may limit lahat ng bagay. Hindi porket sinabing art eh free ka ng gawin kahit na anong gusto mo. Kelangan mo rin i-consider ung makakakita nito. I don't know about the Kulo Exhibit, so I searched for it over the net. There are a lot of artists who use religion for their art subjects, but I don't get what is artistic about his work. His painting of Jesus Christ doesn't seem like original to me. Also his sculptures aren't also. It's like he copied the style from another artist, and he's a professional?? really?? He's good at caricatures though! He should have just stick with that. He's probably just looking for a way to get an attention because artist wants that, and he's using Catholics to get popularity through controversy. I just saw some of his artworks from google images, and I don't like what I see. With art, there are a lot of rules from composition to lighting.. I don't see it with his work. It's just a mickey mouse ears and nose on Jesus Christ. I don't see what artistic about that, it's just plain mockery. He probably did that kind of work on purpose. Isn't this issue from a long time ago? My boyfriend is an artist and I've seen so many of such paintings (may it be online or not). I was an agnostic so i didn't really get affected by it. I'm not taking sides but I don't think what he did was wrong. He merely painted what he believes in. And he may have just wanted to express those. Wouldn't it be better to see paintings that are actually what the artists' wanted to express than to see paintings that are only painted to be sold and for money? Yes, he may have offended a lot of Christians out there but this is art. Art doesn't really follow any religion. And if the people got offended then that just means his paintings are effective. Our country and its people are just not yet as open as it is in other countries which is probably why so many people reacted to this. Hi Steven! May award nga pala ako sayo! Have a great week! nawawala ba yung url ko? anyway, i know art is way of expressing self too. pero ewan ko lang rin. it offended many people pero sa iba okay lang rin. as for me, if it his way to express himself go on. Very nice post. Yes, everybody knows that arts=freedom of expression, but yeah, we have to set our limits. We should also always think about those people who'll get offended by our doings. If you want to be respected, learn how to respect first. again good post. This one needs to be read by everyone, imho. Just a personal opinion though. Art is something very different from anything we can rate and compare. It can be very unique at various times, some people just over-reacted in this issue. So what if the artist did such a scandalous thing, it was his way of expressing support for the RH bill. Someone might as well talk since, this country has more than 94 million people and what, only 1/4 of them eat normally? Yes, we all believe in freedom of speech. But you also have to remember that EVERYONE is entitled to that. You have your opinion, we have ours. Freedom of speech is not the issue here. It's the word "RESPECT". I also have something for you sa aking blog. Check it out Steve.